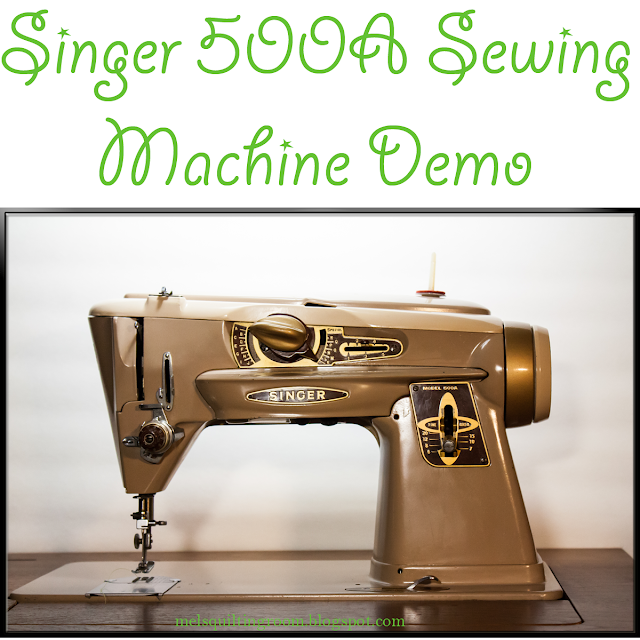 Ahh, the Singer 500 Rocketeer sewing machine, what can I say about it? This sewing machine may actually boast the most names ever. It's model name is the Singer 500, the A stands for where it was made Anderson, SC. It got nicked named the Rocketeer since it came out during the space race. Then it got called the Slant-O-Matic. Doesn't that name just scream the 60s? I'm not sure if Singer was attempting to appeal to the entire population when naming this machine or what but I do know it's an excellent machine. So I don't care if you call it a Singer 500, a Singer 500A, and Singer Rocketeer, or a Singer Slant-O-Matic I just hope you call it yours. This is the machine that sold me on vintage sewing machines. I haven't looked back. This post may contain affiliate links. Making a purchase through the links costs you nothing and puts a few pennies into the fabric budget. I don't know what happened after Singer made this machine but it had to be a sad time. There next line of machines were the Touch and Sew line. I've never used one but in the vintage sewing machine world they are called Touch and Throw. While I love my Merritt 2404 it's twenty years newer and doesn't have as many functions or the style. The Singer 500 is a little slower than the 301 that is in the same family, slant needle machine, but it has so many more features. I did not cover the cams in the video. The cams allow the machine to make even more stitches. I do have a set of cams,but they didn't come with the machine. I've pieced the set together from second hand shops and garage sales. You can purchase the cams online but there are enough built in stitches you might never need the cams. 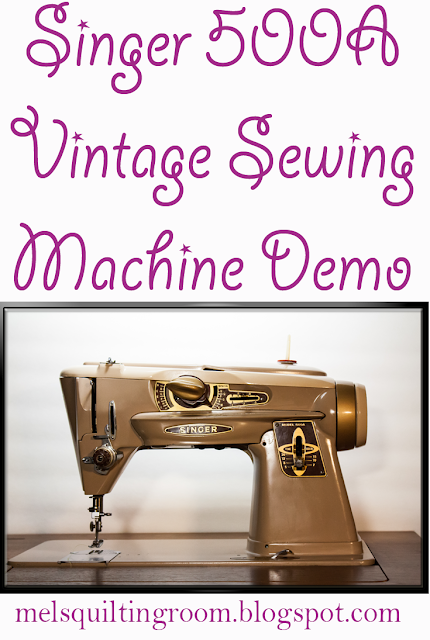 Want to see all my vintage Singer sewing machine demos? Check out this great round up where you will find them all. To see all of the great vintage sewing machine content I have either click on the sewing machine tab at the top of the page or click here. I love old sewing machines! This was fun to watch and I look forward to seeing more machines in the future. I had two of these sewing machines. One I purchased with help from my mother-in-law in 1975. She was a seamstress and told me it was a fabulous machine. It came with everything and I used that machine for at least 28 years. The other was given to me when a friend purchased a newer machine. I sold them both a few years later and regretted doing so. They were wonderful sewing machines! The one I had used for 28 years was pretty worn. The thread had worn a groove where the bobbin went and I couldn't get the parts I needed to replace it. Today I might find something online but then there were not sales sites for these sort of things. I really wish I had them back! I currently own a Bernina 1260 I purchased in 1999. I love this machine and have made a number of quilts with it. I still have mine that I bought in 19611 works great. Now my daughter has it, she learned to sew on it In all those years it cost me about 1$ for a screw that was broken! I've sewn tent canvas , covered vinyl chair seats a faux fur coat and just about everything in between! Best money ever spent! I love my 500a. Makes perfect button holes! Scored a 500a at a yard sale a few of years ago for $35 including all the attachments and a cabinet. It had to go into storage for several years due to lack of space. It has now been hauled out, lubed and it ready to roll. My daily use machine is a 1958/9 404 that belonged to my mom. Also have a 201-2 that was acquired for $15, including the cabinet (suspect the cabinet may be from an even older unit). Love my vintage Singers. Pretty easy to source parts and will run forever with minimal issues.